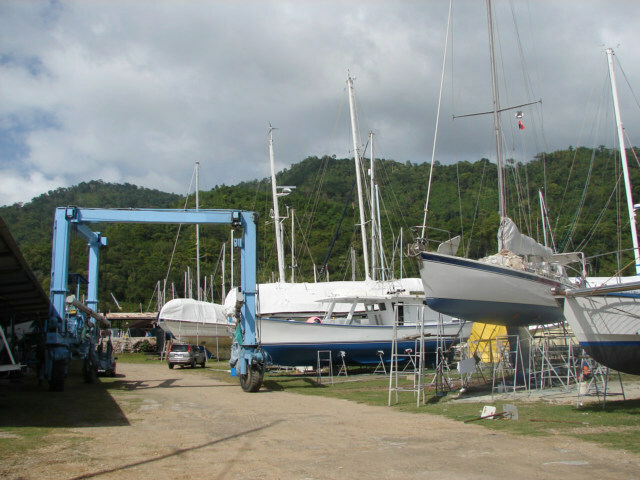 I am in the Chaguaramas Harbor and inside the boat yard called - Powerboats -, there must be about 4-5 major areas here, they are all within the Chaguaramas Park, or land owned or ran by the government of the country of Trinidad and Tobago. I am on the boat by the name of - Odessa- Captain name of Bill. 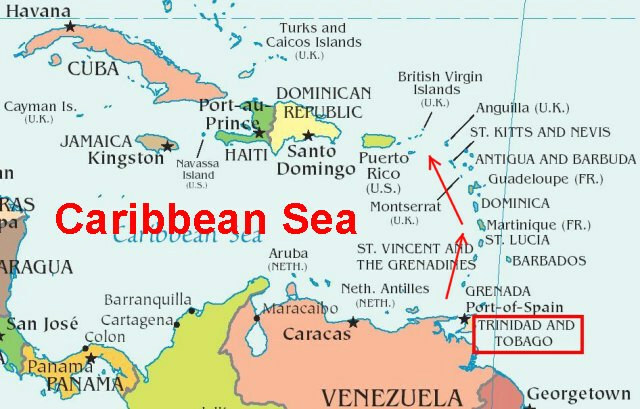 This is a map of the lower part of the Caribbean and the Island Country of Trinidad and Tobago. I have hitched a more or less free ride on a 65-foot MacGregor sailboat with a Canadian Captain by the name of Bill. Craig has opted to come along, so presently there are four of us on the boat and I think we have room to add a few women crew, if we can find any? Life is good, my guess is Bill likes to have some company and this boat is long and fast, however anyway you do it, there is many small things and many small spaces. We will travel north hopefully on Sunday or Monday for the Island Country of Grenada, it is about a 14-hour boat trip and about 90-120 mile north of Chaguaramas. There are maybe different types of miles, kilometers or distances for the Ocean; I think it will be measured in Nautical miles. Nautical Mile, since 1959, an internationally agreed-on standard equaling the average length of one minute of arc on a great circle of the earth, or 1852 m (6076 ft). It seems roughly about 250 feet longer for a nautical mile, I will learn more about navigation on the boat, however I am understand this to be referencing longitude and latitudes. 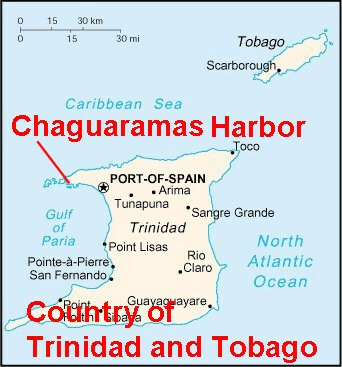 This is a map of Trinidad with the explanation more or less, where the Harbor of Chaguaramas is located. It is about a 15-minute ride in a Maxi-van from the Ferry of the Port of Spain, the cost is 5 TT or about one-dollars USA, we paid 30 for a taxi for two person to come here, however I think it was too much. It is a very easy trip here in a max-van, this is just a normal van size bus, and a combi maybe called in many places. 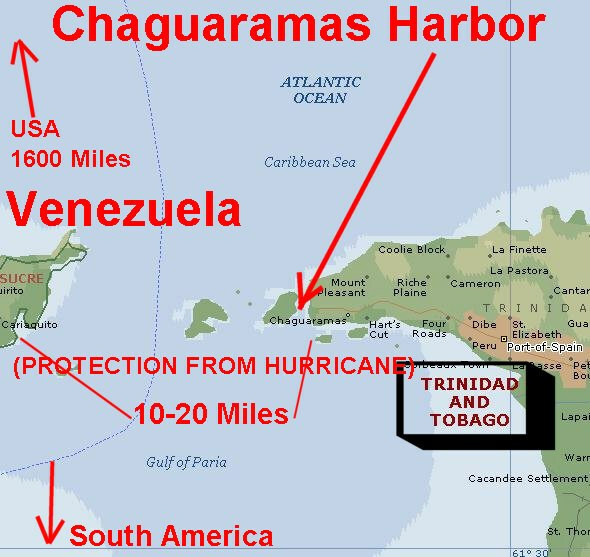 Closer map of the Chaguaramas Harbor, this area is protected from the Hurricanes better, therefore I believe presently many boats harbor here for this reason, plus there are many facilities for repair, the cost must be cheaper also. My guess there are sort of jump points for boat, they start from various locations after a longer jaunt. Maybe they leave from Colon Panama for Cartagena Colombia, then off from Cartagena to Venezuela or Trinidad and Tobago. To crew or jump on a boat a person needs it appears to get on a very large boat and to find the jump-start points. This is a natural jump off point from Venezuela and you can take a Ferry from Venezuela to Trinidad very easily. 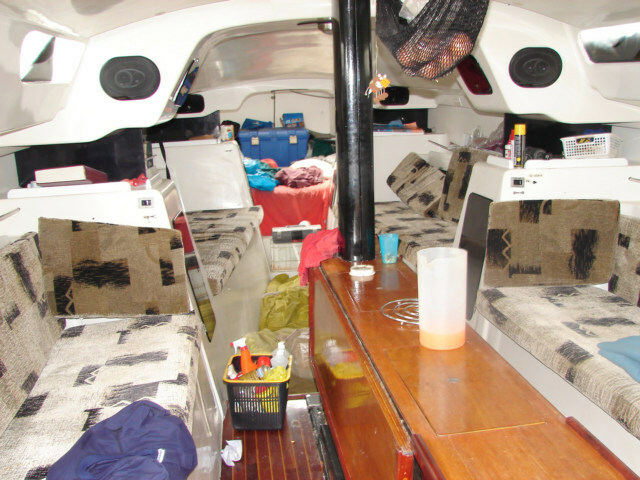 This is the inside of the 65 Foot MacGregor Boat, not very clean, I spent about 5 hours yesterday cleaning the inside, my guess is Jakob is not very clean. His spaghetti he could the night before is still spread out all over the place; he is only 18, full of energy and about aware of the world surroundings as any 18 year old. He has been on the boat he said for about one and a half months, the boat has been here for about one month so he has been on land a lot. I believe in reality most boat are on the hook or at a harbor more than sailing, it would be unreasonable to sail constantly. This is the 65-Foot MacGregor boat, up on jacks or supports; it is very long and narrow and supposed to be some type of racing boat. It is not wide; therefore, a little short on cabin space compared to other 65-foot boats. 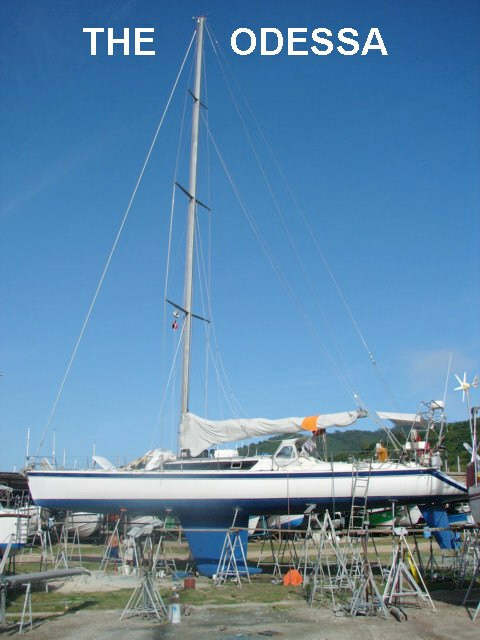 The keel or bottom rudder is very long and this makes it more difficult to enter some harbors. This crane or cradle will lift the boat in a couple of days and put the boat into the water. NOTICE the height of the boat above the others, we are high in comparison to the others, we climb a steel ladder to enter the boat. Bill must pay a daily PER FOOT OF BOAT fee to have it on shore.